Sumarum's management (from left) Mr. Harald Goetsch (CEO), Mr. Lutz Friedrich and Mr. Volker Müller will all continue in the company. Zalaris ASA has agreed to acquire sumarum AG (previously IT2 Solutions AG), a leading human resources outsourcing and consulting company based in Germany. The deal joins two leading SAP Human Capital Management (HCM) and SuccessFactors partners, creating an outsourcing and consulting powerhouse delivering a complete suite of payroll and HCM services covering the Nordics, Baltics, Poland, Germany, Austria, Switzerland, Spain and India. In addition to strong consulting operations, sumarum specializes in successfully executing large SAP HCM projects. Together, the two companies will change the outsourcing landscape through increased solutions development and outsourcing expertise across a wide European reach. The combined business will continue to serve private and public enterprises with the same, high-level SAP HCM and SuccessFactors cloud-based outsourcing and consulting services currently provided by each company. The acquisition gives Zalaris immediate access into Germany, Europe’s largest economy with more than 80 million people and a high concentration of medium and large international companies. Zalaris group including sumarum will employ around 650 employees in the Nordics, Baltics, Poland, Germany, Spain and India. “Teaming up with Zalaris gives us a unique opportunity to expand our reach to international clients, while continuing to deliver quality outsourcing and consulting services to our existing clients,” says Harald Goetsch, CEO and founder of sumarum. Goetsch will continue working for the company along with the rest of the current sumarum management team. Zalaris and sumarum both develop and deliver cloud-based outsourcing and consulting HR solutions leveraging SAP technologies. Once the acquisition has closed, Zalaris expects to deliver additional value to customers and accelerate the development of new and improved outsourcing and consulting services. “Together, we will create more innovative, cost-efficient, user-friendly and reliable HR solutions that support our customers’ goals. Our extended reach with local-language support across borders in Europe should be of particular interest for our multi-national customers,” says Mellerud. Zalaris and sumarum customers will have access to the same comprehensive portfolio of cloud-based HR services, including state-of-the-art mobile applications and SAP SuccessFactors integration and consulting competencies. “Our solutions were designed to be scalable. We can offer all the benefits of leading SAP SuccessFactors HR and payroll solutions as a standardized solution with an attractive entry point in a flexible structure. Also, all our solutions are compliant with the European General Data Protection Regulation (GDPR) that is currently underway,” Mellerud says. The broader geographic reach afforded by the acquisition also presents employee recruitment advantages for people-oriented businesses like Zalaris and sumarum. “With operations in 13 countries, we will be an attractive employer for resources looking for international opportunities in the rapidly growing HR outsourcing and consulting industry across Europe,” Mellerud says. Zalaris delivers comprehensive cloud-based outsourced HR and payroll, as well as consulting services based on SAP HCM and SuccessFactors. The company is certified as a SAP and SuccessFactors Business Process Outsourcing (BPO) Partner and is a leading SAP Human Capital Management (HCM) and SuccessFactors consulting partner. Founded in 2000, Zalaris today operates in Denmark, Estonia, Finland, Germany, India, Latvia, Lithuania, Norway, Poland, Spain and Sweden, including local-language service centers with extensive expertise in HR-related laws and regulations. 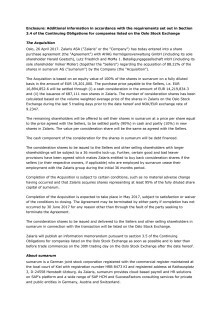 Zalaris (ZAL) is a publicly listed company on the Oslo Stock Exchange. Learn more at www.zalaris.com. sumarum offers a full range for employee services, and is a specialist on the use of and introduction of software to SAP HCM and SucessFactors systems. sumarum, formerly known as IT2 Solutions, is one of the largest owner-controlled consulting and outsourcing services firms in Germany and was founded in 2001.The company focuses as a one-stop-shop services provider for all relevant back-office processes of its clients (e.g., accounting, HCM, analytics, etc.). Today, the company has six locations in Germany, and all specialize in different areas of the sumarum portfolio. sumarum has a broad spectrum of customers within public services, service providers, large industry players, energy companies and companies and trusts within the healthcare sector. In April 2017, the company was renamed sumarum and today has about 180 employees.